With faster data transfer rates, better coding methods and higher storage capacities, digital streaming music formats have developed in recent years as a serious alternative to traditional media playback and now exist for HiFi applications in a number of appropriate solutions. These include so-called streaming clients, for example, which serve as a bridge between an existing system and the digital world. 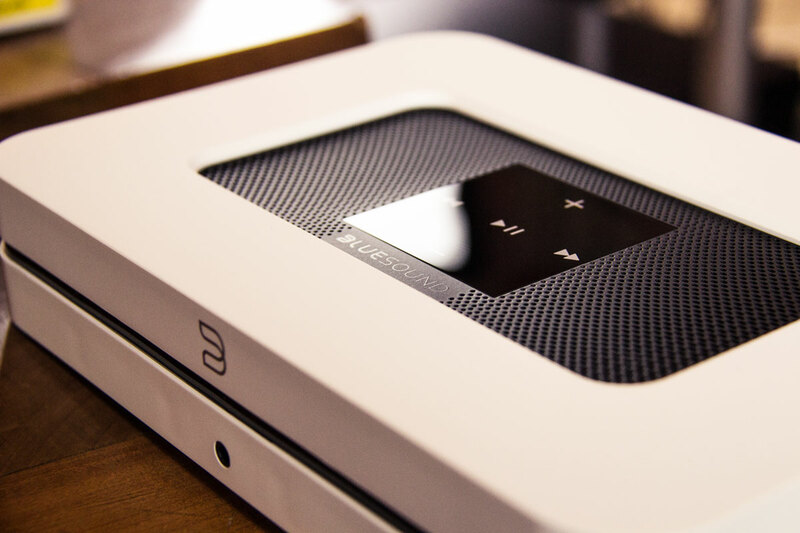 We provide two devices in this category – Auralic Aries Mini and Blue Sound Node 2 – each with their different emphases. 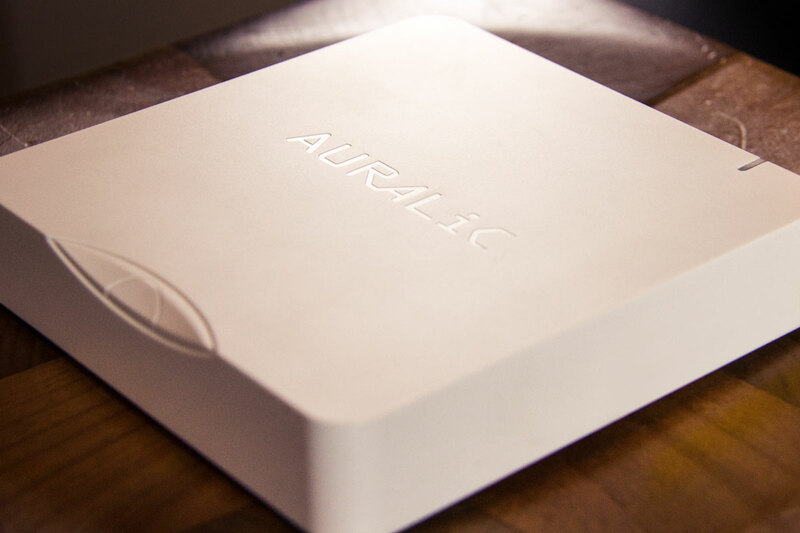 We’ll start with the Aries Mini from Chinese manufacturer Auralic and first say a few words to the manufacturer. The Hong Kong-based company whose foundation was incidentally conceived by a random coincidence of the two music enthusiasts Xuanqian Wang and Yuan Wang meeting here in Berlin thus being created in 2008. This means quality constructed hi-fi components which have quickly developed an excellent reputation. Although it is the very recently released Aries Mini is the smallest model of the entire portfolio, makes the naming reference to the quite rightly acclaimed Auralic Aries unmistakably clear that despite the obvious differences between the two devices similarly high levels can be expected. In direct comparison, of course, first turn to the much simpler designed and 13.5 x 2.8, 13.5 cm in very compact housing because more reminiscent of Apple’s desktop Mac Mini the big brother of the house Auralic. In addition, three buttons on the front panel must satisfy as a complement to the already almost indispensable app – an additional remote control as the big Aries was waived. The same goes for the special power supply and the front display. 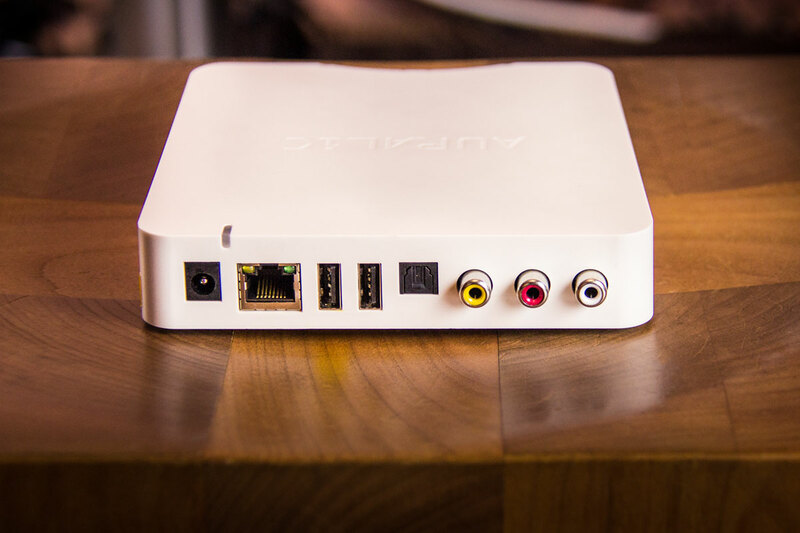 However, the minimalism of Aries Mini has limits and so a look at the back various connection options: In addition to the Ethernet jack, two USB ports (1x input, 1x output, eg for external DACs.) and one each digital TOSLINK and coaxial interface can be found here, an analog stereo output with RCA connectors. This replaces the rather exotic AES interface of great Aries and on top of that a clear indicator that the Aries Mini a D/A converter – Model SABRE ES9018K2M – has been donated. This decision of the developer is to be welcomed for two reasons: On the one hand can be forwarded signals so easily even on components without digital inputs, on the other hand would even be the direct connection of two active speakers to the Aries Mini a conceivable usage scenario. A wireless module is of course also on board, furthermore offers – you can hardly believe it – the narrow housing also a 2.5-inch hard disk drive in the HDD or SSD format place, so the Mini as required by pure intermediaries to the music server with integrated storage. At least as important as the hardware is the software for a device like the Aries Mini. 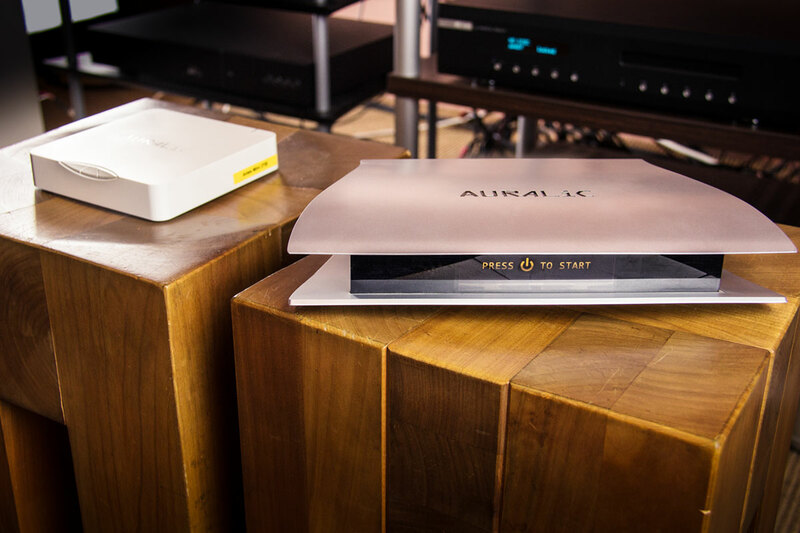 Designed by Auralic system called Lightning DS and support in addition to the almost obligatory standards UPnP or DLNA and Apple’s proprietary AirPlay protocol as well as the open and used for example by the manufacturer Linn Openhome structure. The latter serves as the connection of a USB hard drive or accessing shared folders on the network as a communication basis, once they have been configured using the Lightning DS app as so-called Lightning Server. This are certain amenities in the handling of the corresponding music libraries, for example in the form of “gapless playback” or additional sorting options such as sample rate or file format available. The list of supported file types is long and includes AAC, AIFF, ALAC, APE, DIFF, DSF, FLAC, MP3, OGG, WAV, WMA and WV. Lossless PCM formats can be processed up to 384 kHz / 32 bit and DSD data to DSD256..
We now come to the Lightning DS app that acts as a control center of the Aries Mini. In this regard, there are first to report bad news – it is in fact only available for iOS and beyond exclusively for the iPad (!). This is all the more unfortunate because it is equally clearly designed and comfortable, stable, and would certainly find fast friends even when users of other devices and platforms. 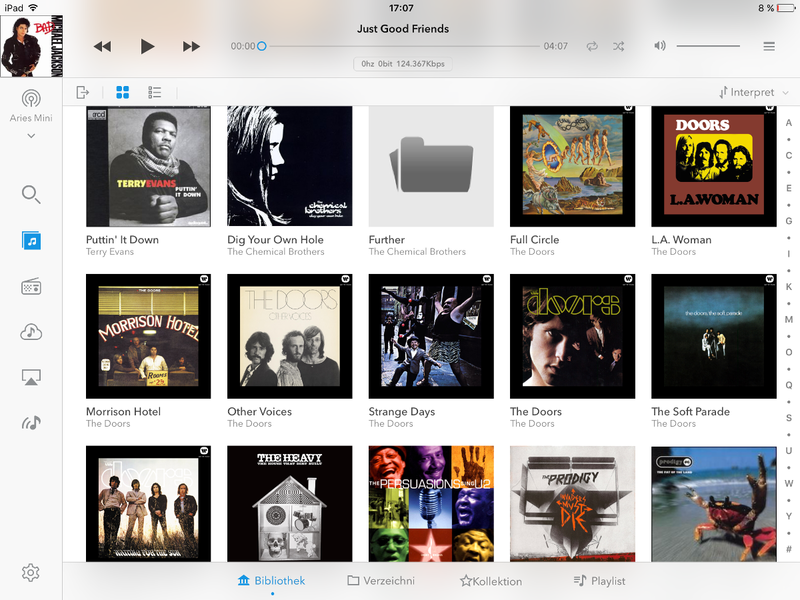 If you own an Apple tablet, browsing works through the media library in any case is absolutely exemplary. Some online streaming providers were directly implemented, however, the selection of Tidal and Qobuz precipitates manageable. In this point – so much has already been revealed at this point – the Blue Sound node has 2 more to offer, but here too we want first provide a general overview. 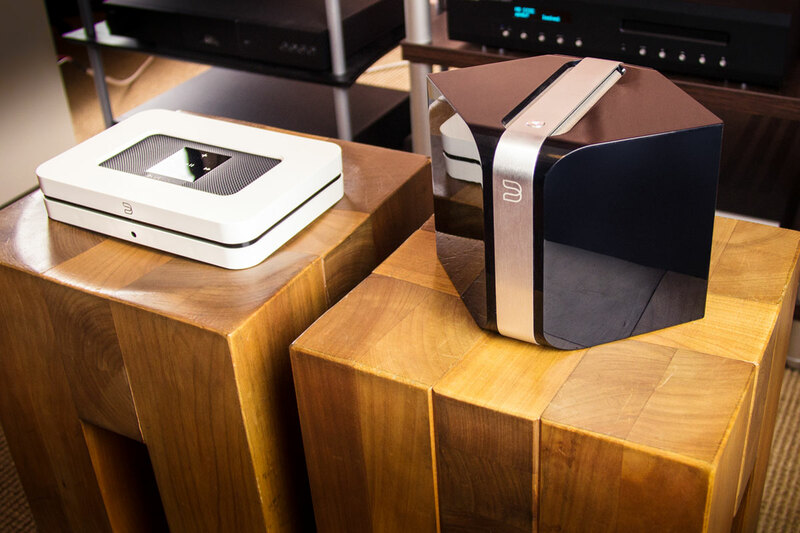 The young US company Blue Sound, incidentally, a collaboration between the renowned hi-fi specialists of NAD Electronics and PSB Speakers, made its first appearance in 2014 and positioned itself with its comprehensive multiroom system in direct competition with the top dog of Sonos. Here Blue Sound from the outset had consistently high sound quality and supports high resolution formats and could be so successful in the market. With the appearance of the second generation of our own “ecosystem”, to which the presented Node 2 belongs, has changed in the underlying philosophy little, however, the quite pugnacious exterior of Node, PowerNode and Co. in favor of a more classic designs was abandoned. The original housing, as quasi horizontal by 45 ° rotated cube designed and manufactured predominantly from a little scratch-prone plastic, was replaced at the Node 2 by a flat, rectangular shape that fails altogether somewhat more generous than the Aries Mini (220 x 46 x 146 cm ). The surface is now matt and consists largely of pleasantly grippy rubber, a fine grid to the placed on top, touch-panel allows a view into the interior of Node 2. The central touch button works also as a status light and, depending on color to the current operating status back. there is also a headphone jack on the front. All other inputs and outputs are located on the back. The equipment is similar in scale when Aries Mini, but the priorities are set differently. 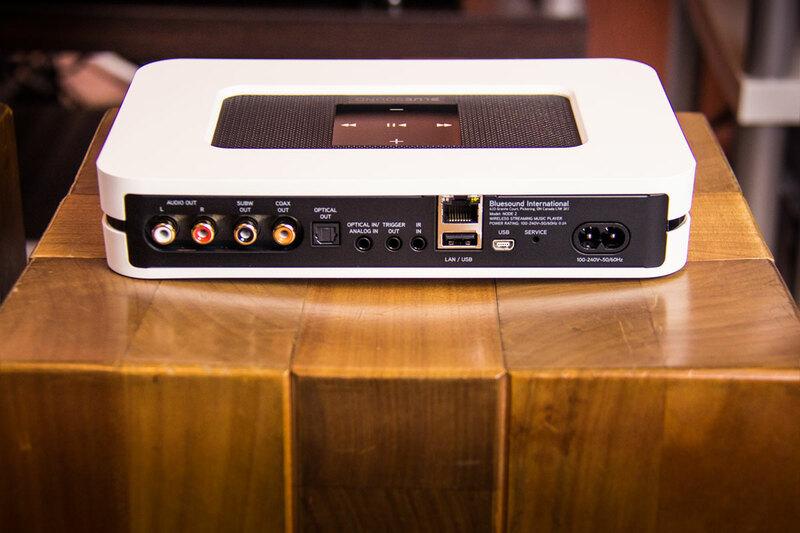 During the stereo output with RCA connectors can be found in both devices, the Node 2 also has a dedicated subwoofer output. The digital outputs are again identical, the analog / digital combination input of Node 2 you look at the Aries Mini, however in vain. For the Blue Sound client does not provide USB output – the mini-USB port is reserved for service purposes. A network connection can be established either via Ethernet cable or via Wi-Fi, also a Bluetooth module was integrated that supports the sound better aptX codec. Furthermore, the trigger out and the infrared In should be mentioned that allow remote control of Node 2 in conjunction with other devices. The installation of a hard drive is not possible in this case – there possibly worth taking a look at the Blue Sound Vault 2. The Americans have developed for their products has its own operating system, which goes by the name BlueOS and ensuring the smooth interaction of all components involved. Unlike Aries Mini the number of supported network protocols is limited. 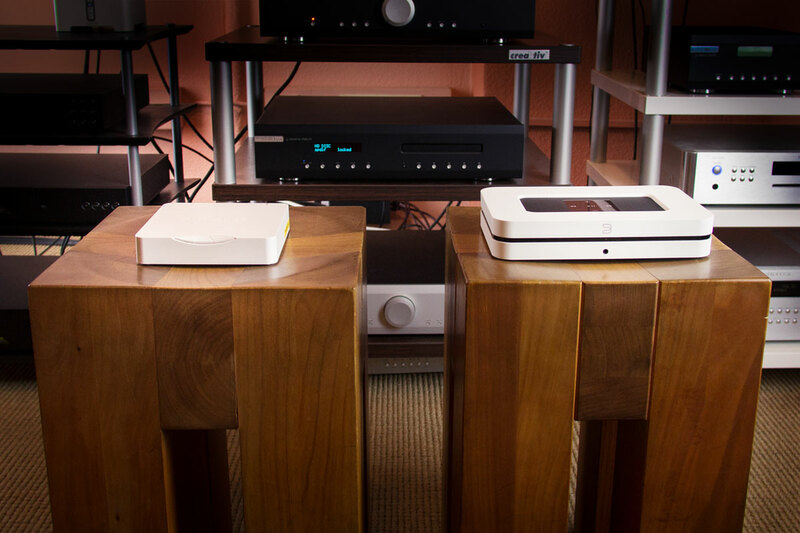 The road on the conventional network share is the Node 2 the only way, UPnP, DLNA or Apple AirPlay are not supported. For this, the system processes a similar format diversity as Auralics Lightning DS (MP3, AAC, WMA, OGG, WMA L, FLAC, ALAC, WAV and AIFF). DSD–encoded files are currently on the sidelines, the maximum resolution is 192 kHz / 24 bit. Fortunately, the Blue Sound app for a whole range of different operating systems is available. In addition to iOS and Android also Android-based Fire OS is supported by Amazon, also exist desktop versions of the software for Windows and MacOS. The service is also good, is in direct comparison somewhat behind the Lightning DS app back. 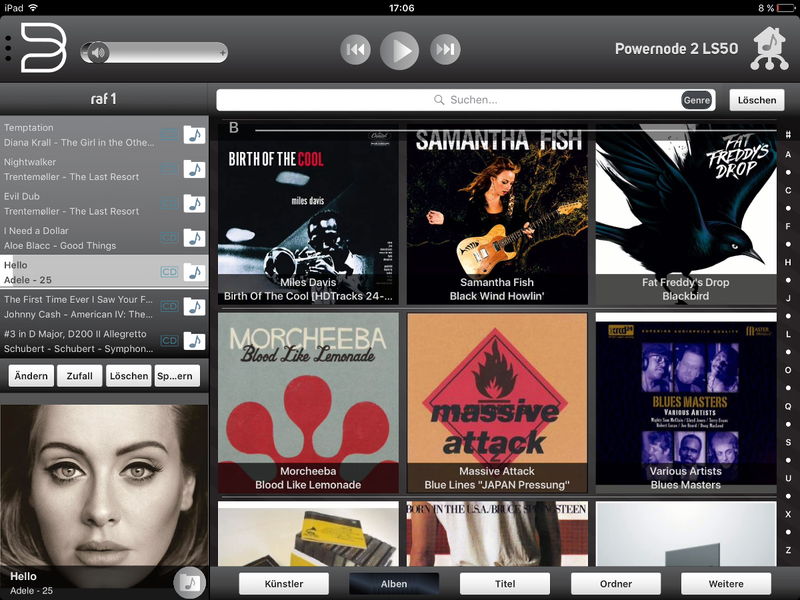 Noteworthy is especially the wide range of music services implemented. With the streaming providers Deezer, JUKE, Murfie, Napster, Qobuz, Rhapsody, Spotify and Tidal and radio services iHeartRadio, Slacker Radio and TuneIn no wishes should stay open in this regard. We do not at this point for several reasons, a detailed discussion of the sound of the two streaming clients. First, of course, determines the respective total setup where Auralic Aries Mini or Blue Sound Node 2 their service do the final sound with decisively. In addition, it can be said that the sound level of both devices in any case is so high, so that the streamer in all cases most likely to be problematic for the “bottleneck” in the audio chain hardly. Much more important is the different orientation of the models in question of the appropriate client: To use the full comfort of Aries Mini, iPad is essential and the AirPlay support for additional synergy effects in an Apple environment. play The ability DSD files is certainly also very attractive for a specific group of users. On the other hand you have the Blue Sound attest Node 2 is a significantly greater flexibility in online streaming and in combination with different operating systems. Moreover, it can be quite interesting, a via node to use 2 extend Stereo Out in conjunction with other multi-room components manufacturer, to which can centrally managed music library into several rooms if required stream.